Dr. Elsayes is an Associate Professor, Department of Diagnostic Radiology, University of Texas MD Anderson Cancer Center, Houston, TX; and Dr. Caoili is a Clinical Associate Professor, Department of Radiology, University of Michigan Health Center, Ann Arbor, MI. Noninvasive imaging can be useful in overcoming the challenges of detecting and characterizing adrenal masses. Imaging characteristics based on morphologic and physiologic features can guide the radiologic management of adrenal lesions. 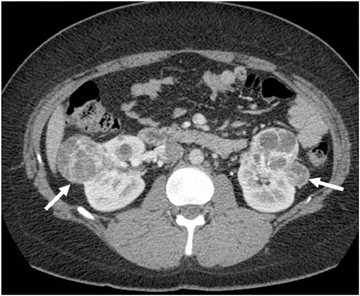 Although uncommon, various adrenal masses can mimic adrenal adenomas, mainly due to low attenuation on CT or the signal loss on out-of-phase MR pulse sequences compared to in-phase sequences. 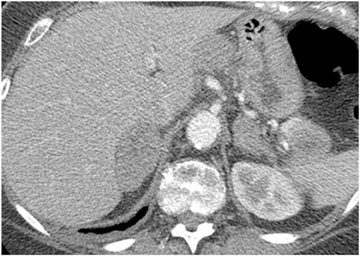 Simple cysts can mimic adrenal lipid-rich adenomas on unenhanced CT, as it could demonstrate attenuation value <10 HU. However, simple cysts do not enhance on postcontrast series, and they also exhibit high-signal intensity on T2-weighted MR images (Figure 4). Metastatic deposits containing intracellular lipid could develop secondary to primary malignancies containing intracellular lipid such as hepatocellular carcinoma or renal cell carcinoma (clear cell subtype).13,14 The presence of intracellular lipid in these masses results in signal loss in out-of-phase pulse sequences compared to in-phase pulse sequences, making them difficult to differentiate from the more common adrenal adenomas. Adrenal cortical carcinoma (ACC) has also been reported to contain intracellular lipid.15 However, adrenal cortical carcinomas are usually large at presentation, and the distribution of intracellular lipid in ACC would be rather inhomogeneous. 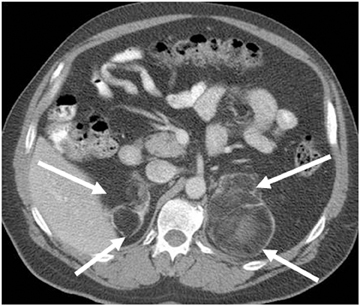 Congenital adrenal hyperplasia can have a characteristic appearance of multiple bilateral adrenal masses containing extensive macroscopic fat that could result from prolonged stimulation of the adrenal cortex by elevated ACT levels (Figure 7). Adrenal hemorrhage can occur in the settings of postoperative states, trauma, stress, hypotension, and various bleeding diatheses as well as eclampsia of pregnancy and sepsis. 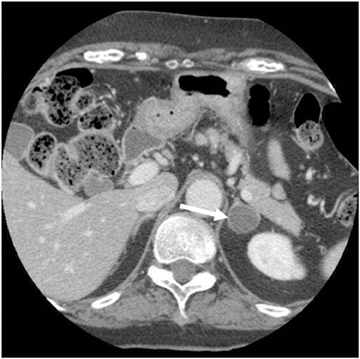 On CT, adrenal hemorrhage can be seen as high density on unenhanced images (Figure 9). Its appearance overlaps with that of other lesions following contrast enhancement. 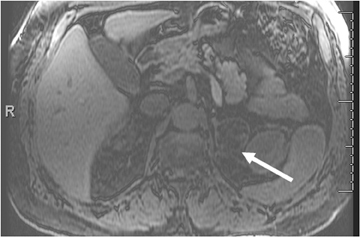 Adrenal insufficiency (Addison’s disease) can be a secondary effect of bilateral adrenal hemorrhage.27 MR imaging is the most sensitive and specific modality for diagnosing adrenal hemorrhage. 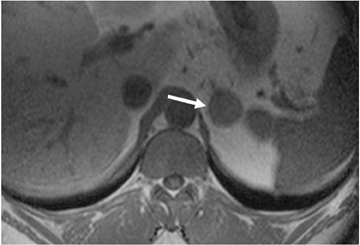 MR imaging features vary according to the age of the hematoma. The appearance of blood products at MR imaging varies with their stage of evolution. Acute blood in the form of deoxyhemoglobin is isointense relative to muscle on T1-weighted images and has low intensity on T2-weighted images. Subacute blood in the form of methemoglobin is hyperintense on T1-weighted images. Initially, methemoglobin is intracellular and has low signal intensity on T2-weighted images. Subsequently, as the red cells lyse and the methemoglobin becomes extracellular, it has high signal intensity on T2-weighted images. Old hemorrhage has low signal intensity on both T1- and T2-weighted images because of the presence of hemosiderin. T1-weighted fat-saturated images are quite sensitive in the detection of methemoglobin. GRE images can magnify the susceptibility effects of decreased signal intensity seen with hemosiderin and deoxyhemoglobin, thereby increasing their conspicuity. Similarly, a lesion that loses a substantial amount of signal intensity on in-phase images compared with out-of-phase images obtained with a shorter echo time may contain blood products. Pheochromocytomas are uncommon tumors arising from the adrenal medulla and the sympathetic paraganglia. Sympathetic ganglia are found predominantly in the para-axial region of the trunk along the prevertebral and paravertebral sympathetic chains and in the connective tissue in or near the walls of pelvic organs. Pheochromocytoma has been called the “10% tumor” because approximately 10% are bilateral, 10% are malignant, 10% occur in children, and 10% are extra-adrenal. It is difficult to differentiate benign pheochromocytomas from malignant, histologically. Therefore, malignancy is usually established by local invasion or metastases. Pheochromocytomas can be associated with multiple endocrine neoplasias (MEN2), Von Hippel-Lindau Disease (VHL) (Figure 10), Von Recklinghausen neurofibromatosis (NF1) and nonsyndromic familial pheochromocytoma.28 Elevated levels of urinary metanephrine or resting plasma catecholamines can suggest the diagnosis of pheochromocytoma. Adrenal cortical carcinomas are rare tumors, affecting approximately 2 patients per million, with a peak incidence in patients 30 to 70 years of age.30 Adrenocortical carcinoma is typically an aggressive malignancy with a poor prognosis, although less virulent forms do occur. The tumors can present either due to hormone production causing Cushing syndrome or Conn syndrome, or due to mass effect from the primary or metastatic lesions. Other manifestations include an abdominal mass and abdominal pain. Typically, adrenal cortical carcinoma is large at presentation, usually measuring more than 6 cm. Heterogeneous texture on CT and MRI is usually noted, owing to the presence of internal hemorrhage, necrosis, and calcification (Figure 11).31 Adrenocortical carcinoma can contain foci of intracytoplasmic lipid, which results in a loss of signal intensity on out-of-phase images.31,32 Large adrenal carcinomas tend to invade the adrenal vein and inferior vena cava. Adrenal adenoma is the most common adrenal mass, and metastases is the most common malignant adrenal mass. 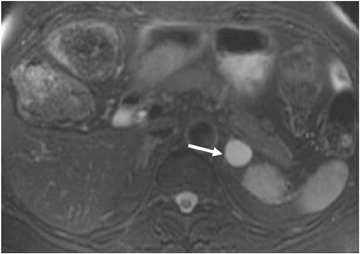 Most imaging techniques were developed to differentiate adenoma from metastatases, with CT washout technique as the most sensitive and specific imaging technique. Using CT, <10 HU on noncontrast series indicates a lipid-rich adenoma, and >10 HU on noncontrast series is indeterminate, and one should proceed with the washout technique. Washout >60% indicates diagnostic for lipid poor adenoma. MRI is helpful in the setting of heterogeneous mass as well as in contrast issues, such as allergy, or renal insufficiency. In-phase/out-of-phase MRI is very useful for diagnosing lipid-rich and most lipid-poor adenomas, but is limited in characterizing few cases of lipid poor adenomas. 16.5% signal dropout is diagnostic of adenoma. Metastatic deposits of primary malignancies containing intracellular lipid (such as HCC and RCC) could mimic adenoma. 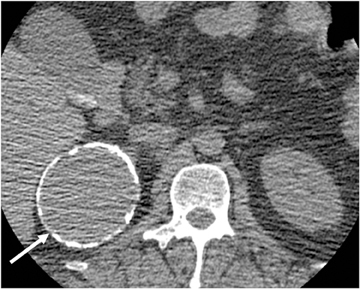 Simple cysts may also mimic adenoma on noncontrast CT. Rarely, adrenal cortical carcinoma contains intracellular lipid and very rarely contains macroscopic fat. The presence of macroscopic fat is consistent with myelolipoma, until proven otherwise. Pseudocyst can have a large heterogeneous pattern, thus mimicking carcinoma. Pheochromocytomas are better characterized by MRI. Although variable, a constellation of features, including lack of intracellular lipid, high signal intensity on T2-weighted images, and contrast enhancement, is suggestive of pheochromocytoma. Elevated plasma metanephrine levels are also consistent. Adrenal cortical carcinoma is typically large and heterogeneous at presentation. The tumor can present due either to hormone production causing Cushing syndrome or Conn syndrome or to mass effect. Caoili EM, Korobkin M, Francis IR, et al. 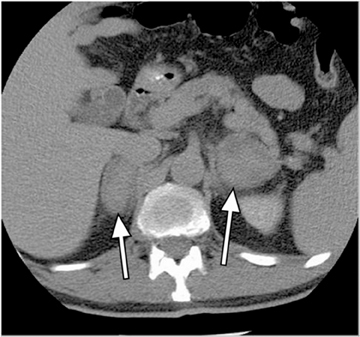 Adrenal masses: Characterization with combined unenhanced and delayed enhanced CT. Radiology. 2002;222:629-633. Fujiyoshi F, Nakajo M, Fukukura Y, et al. Characterization of adrenal tumors by chemical shift fast low-angle shot MR imaging: Comparison of four methods of quantitative evaluation. AJR Am J Roentgenol. 2003;180:1649-1657. Haider MA, Ghai S, Jhaveri K, Lockwood G. Chemical shift MR imaging of hyperattenuating (>10 HU) adrenal masses: Does it still have a role? Radiology. 2004;231:711-716. Israel GM, Korobkin M, Wang C, et al. 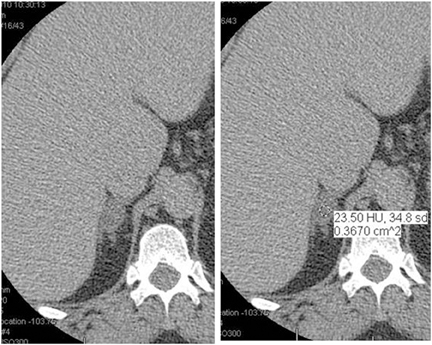 Comparison of unenhanced CT and chemical shift MRI in evaluating lipid-rich adrenal adenomas. AJR Am J Roentgenol. 2004;183:215-219. 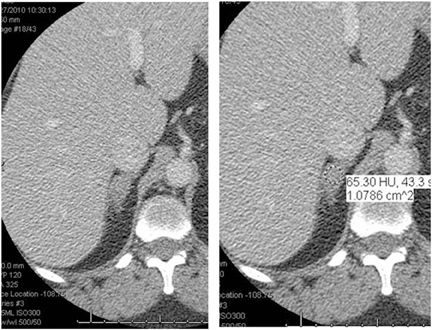 Tsushima Y, Takahashi-Taketomi A, Endo K. Diagnostic utility of diffusion-weighted MR imaging and apparent diffusion coefficient value for the diagnosis of adrenal tumors. J Magn Reson Imaging. 2009;29:112-117. Caoili EM, Korobkin M, Brown RK, et al. Differentiating adrenal adenomas from nonadenomas using (18)F-FDG PET/CT: quantitative and qualitative evaluation. Acad Radiol. 2007;14:468-475. Mitchell DG, Crovello M, Matteucci T, et al. Benign adrenocortical masses: Diagnosis with chemical shift MR imaging. Radiology. 1992;185:345-351. Korobkin M, Lombardi TJ, Aisen AM, et al. Characterization of adrenal masses with chemical shift and gadolinium-enhanced MR imaging. Radiology. 1995;197:411-418. Namimoto T, Yamashita Y, Mitsuzaki K, et al. Adrenal masses: Quantification of fat content with double-echo chemical shift in-phase and opposed-phase FLASH MR images for differentiation of adrenal adenomas. Radiology. 2001;218:642-646. Semelka RC, Shoenut JP, Lawrence PH, et al. 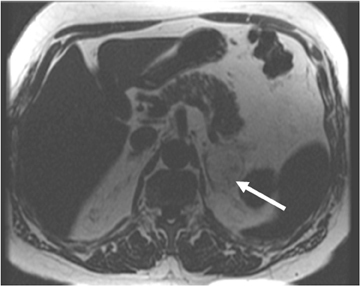 Evaluation of adrenal masses with gadolinium enhancement and fat-suppressed MR imaging. J Magn Reson Imaging. 1993;3:337-343. Elsayes KM, Mukundan G, Narra VR, et al. Adrenal masses: MR imaging features with pathologic correlation. Radiographics. 2004;24:S73-S86. Papotti M, Sapino A, Mazza E, et al. Lipomatous changes in adrenocortical adenomas: Report of two cases. Endocr Pathol. 1996;7:223-228. Shinozaki K, Yoshimitsu K, Honda H, et al. 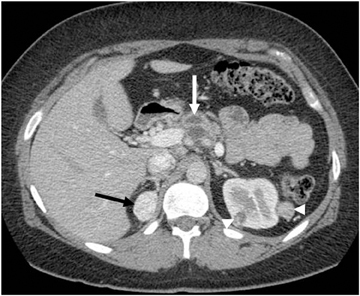 Metastatic adrenal tumor from clear-cell renal cell carcinoma: A pitfall of chemical shift MR imaging. Abdom Imaging. 2001;26:439-442. Sydow BD, Rosen MA, Siegelman ES. Intracellular lipid within metastatic hepatocellular carcinoma of the adrenal gland: A potential diagnostic pitfall of chemical shift imaging of the adrenal gland. AJR Am J Roentgenol. 2006;187:550-551. Yamada T, Saito H, Moriya T, et al. 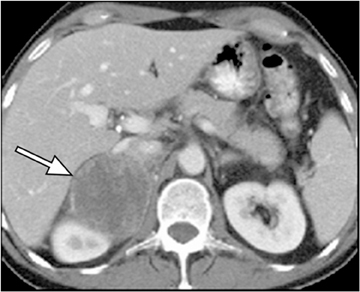 Adrenal carcinoma with a signal loss on chemical shift magnetic resonance imaging. J Comput Assist Tomogr. 2003;27:606-608. Abrams HL, Spiro R, Goldstein N. Metastases in carcinoma: Analysis of 1000 autopsied cases. Cancer. 1950;3:74-85. DeAtkine AB, Dunnick NR. The adrenal glands. Semin Oncol. 1991;18:131-139. Schwartz LH, Macari M, Huvos AG, et al. 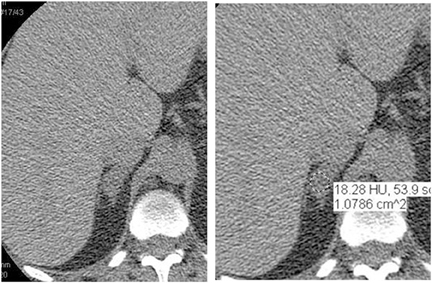 Collision tumors of the adrenal gland: Demonstration and characterization at MR imaging. Radiology. 1996;201:757-760. Boraschi P, Braccini G, Gigoni R, et al. Adrenal myelolipomas: Their magnetic resonance assessment. Clin Ter. 1996;147:549-557. Elsayes KM, Korobkin MT, Neiderman BJ. Lipomatous adrenal metaplasia: Computed tomography findings in 2 presumed cases. J Comput Assist Tomogr. 2009;33:715-716. Ferrozzi F, Bova D. CT and MR demonstration of fat within an adrenal cortical carcinoma. Abdom Imaging. 1995;20:272-274. Lee MJ, Mayo-Smith WW, Hahn PF, et al. State-of-the-art MR imaging of the adrenal gland. Radiographics. 1994;14:1015-1029. Rozenblit A, Morehouse HT, Amis ES. 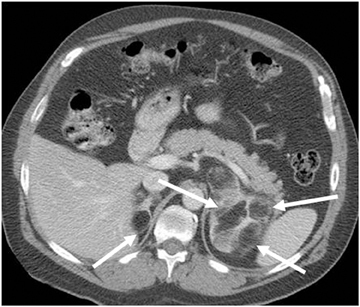 Cystic adrenal lesions: CT features. Radiology. 1996;201:541-548. Pollack HM. Miscellaneous conditions of the adrenals and adrenal pseudotumors. Clin Urogr. 1990;3:2403-2405. Tagge DU, Baron PL. 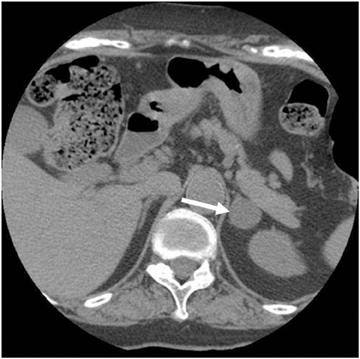 Giant adrenal cyst: Management and review of the literature. Am Surg. 1997;63:744-746. Lumachi F, Zucchetta P, Marzola MC, et al. Usefulness of CT scan, MRI and radiocholesterol scintigraphy for adrenal imaging in Cushing’s syndrome. Nucl Med Commun. 2002;23:469-473. Xarli VP, Steele AA, Davis PJ, et al. Adrenal hemorrhage in the adult. Medicine. 1978;57:211-221. Elsayes KM, Narra VR, Leyendecker JR, et al. MRI of adrenal and extraadrenal pheochromocytoma. AJR Am J Roentgenol. 2005;184:860-867. Elsayes, KM, Menias CO, Siegel CL. 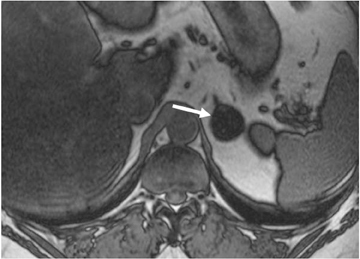 Magnetic resonance characterization of pheochromocytomas in the abdomen and pelvis: Imaging findings in 18 surgically proven cases. J Comput Assist Tomogr. 2010;34:548-553. Schlund JF, Kenney PJ, Brown ED, et al. Adrenocortical carcinoma: MR imaging appearance with current techniques. J Magn Reson Imaging. 1995;5:171-174. Mackay B, el-Naggar A, Ordonez NG. Ultrastructure of adrenal cortical carcinoma. Ultrastruct Pathol. 1994;18:181-190. Adrenal imaging: A practical guide to diagnostic workup and spectrum of imaging findings. Appl Radiol.